Getting a date to prom requires confidence and taking the risk to ask someone. Going to the prom is a major social milestone in the lives of many girls. 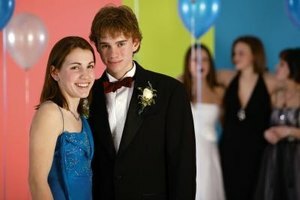 While some girls may choose to attend prom without a date, getting a prom date may require that you step out of your comfort zone by interacting with guys at school, looking to your social supports and friends for help and taking initiative by asking a guy if he has a date to the prom. Before embarking on a quest to find a prom date, you should first examine your options for prom dates. Immediately eliminate any guys who are dating someone, or who you know are taking other girls. Once you have eliminated any guys with dates, make a list of eligible boys that may not have dates to prom that you would be happy bringing along as your date. Talk to your friends about your desire to go to prom with someone. Your friends can be a vital resource in finding a prom date. If you don't talk to many guys, your friends might know who is asking whom to prom and also know who does not have a date. They may even have a single friend who needs a date as well that they can set you up with. Even if they don't know of anyone looking for a date, they may be willing to break the ice and ask around for you. Shyness can quickly overwhelm you and jeopardize your attempts to get a prom date. Shyness at its core is very similar to anxiety according to psychologist Bill Knaus. In his article in "Psychology Today," Knaus explains that you can overcome the feelings associated with shyness toward boys by watching your friends ask a guy to prom, then visualizing yourself in her place. Knaus also reminds readers that only you are in control of your feelings, so you can set yourself up for a positive outcome by thinking positively and approaching the situation in a confident manner. Jeremy Nicholson, psychologist suggests that being attractive, both physically and psychologically, can improve your odds at social finding a date. Nicholson suggests in "The Attraction Doctor," that being open-minded, optimistic and sharing fun qualities about yourself can make you seem more psychologically attractive. Nicholson also suggests looking your best, clarifying that you don't need to be a supermodel, but being clean, well-groomed and wearing flattering clothing that fits can be assets to finding a date. Taking initiative can be nerve-wracking, but you stand the best chance of getting a prom date by outright asking someone, even if you don't know him that well. Hald and Hogh-Olesen examined this situation in a study published in "Evolution & Human Behavior" by having a moderately attractive person approach 173 men and ask them on a date. About 68 percent of single men agreed to a date from this total stranger. If this applies to real life, about seven out of every 10 single guys that you ask to prom will likely accept if you take initiative and ask them. Oster, Anthony. "How to Get a Prom Date if You're Shy & Don't Really Talk to Guys." Synonym, https://classroom.synonym.com/prom-date-shy-dont-really-talk-guys-16034.html. Accessed 18 April 2019.